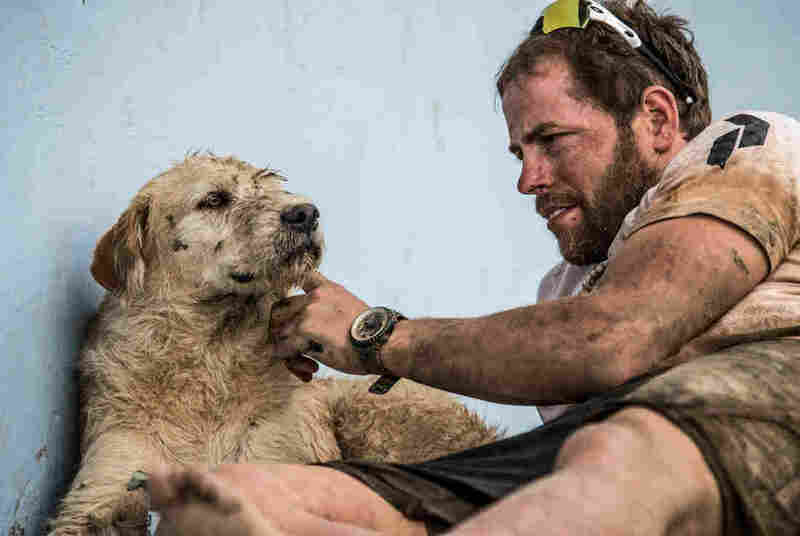 Dog Follows Athletes Through Mud And Water, And Melts Hearts : The Two-Way After a stray dog met a team of Swedish adventure athletes in Ecuador, he ran for miles through rough terrain and swam to keep up. Now Arthur the dog is famous — and it all started with a meatball. Team Peak Performance says that after six days, they "crossed the finish line with 5 members instead of 4 as the 12th top team in the world." 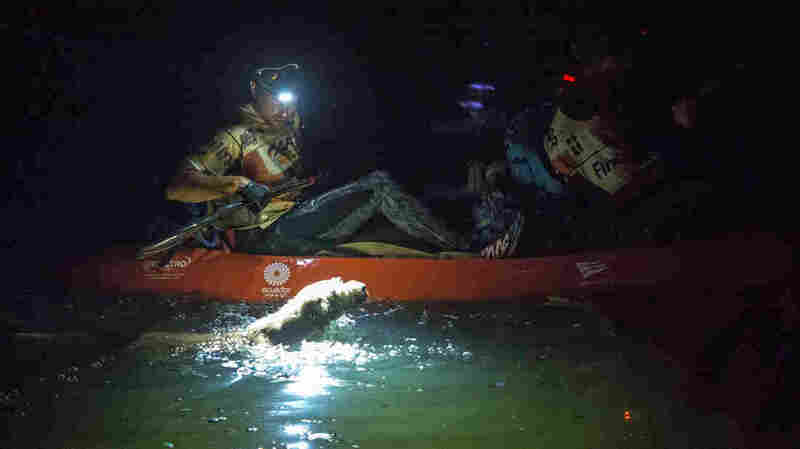 Sweden's Peak Performance team was in Ecuador this month to compete in the Adventure Racing World Championship, in which athletes hike, kayak, and bike during a 430-mile endurance race through the Amazonian rain forest. It's the kind of race where athletes try to keep moving day and night (see an example). Just before starting one stage, the team's Mikael Lindnord made friends with a dog, sharing a meatball with him. Lindnord thought that would be the end of it — but then the dog followed him, and essentially forced his way onto the team. 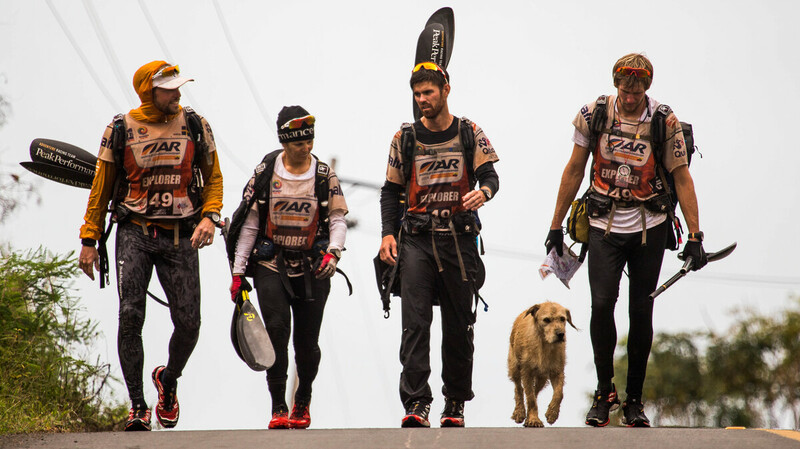 The rest of the story is told through photos of the Peak Performance group's trek, as updates on their Facebook page show the four athletes making their way through mud and rough terrain, now joined by the dog they named Arthur. And when they had to use kayaks, Arthur swam alongside, refusing to be left behind. Photos of the devoted dog swimming to stay with his new friends led one fan to call the moment "magical." The team says that after six days, they "crossed the finish line with 5 members instead of 4 as the 12th top team in the world." After some uncertainty, Lindnord managed to work out a way to bring his new best friend back to live with his family in Sweden: He and his teammates opened a Paypal account and mounted a Twitter campaign to raise money to bring Arthur home. They've also had him treated for a nasty wound to his back that he had suffered months before they met in him the rainforest. A recent Facebook post thanking people for their help and good wishes — and telling them that Arthur was safe and sound in Sweden — led one fan to write, "Thank you for sharing this story with the world. We need to witness more happy endings and acts of compassion." "Arthur is in the dog quarantine in Stockholm, where he has to be for 120 days before he can go home to Örnsköldsvik, where he will live with the Lindnord family. A team member visited him today and there will be more visits during these months — but Arthur also has to be given time to relax and adapt to his new settings!" The team also says it has established the Arthur Foundation, to support stray dogs.